Cabbage and Dream Wife both bring their UK tours to the region next week. Manchester based five-piece Cabbage serve up an idiosyncratic, satirical attack in the form of discordant neo post-punk. The band released Young Dum and Full Of… in January, a collection of their early EPs Uber Capitalist Death Trade, Necroflat In The Palace and Terrorist Synthesizer. 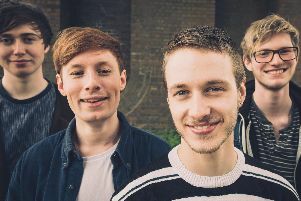 Cabbage comprise singer Lee Broadbent, guitarists Joe Martin and Eoghan Clifford, bassist Stephen Evans and drummer Asa Morley. Last month, they released the Skeleton Key mix of their track Kevin. This summer they played the Reading and Leeds festivals as well as the likes of Kendal Calling, Truck Festival and Latitude. Cabbage headline Esquires in Bedford on Wednesday, October 18. Support is by The Blinders and Queen Zee & the Sasstones. Doors open at 7.30pm, tickets cost £13 in advance. On Friday, October 20, Dream Wife headline the venue. The trio released their latest EP Fire last month. The EP featured the title track, Somebody and three re-mixes of Fire. It follow’s last year’s single FUU. Dream Wife comprise of singer Rakel Mjöll, guitarist Alice Go and bassist Bella Podpadec. This year they played their first dates in the US, including a gig at the annual SXSW festival, played the DIY Stage at Live at Leeds and joined The Cribs and Public Service Broadcasting and Manic Street Preachers at Live From Times Square in Newcastle. Support is by King Purple. Doors 8pm, tickets £8.80.